Mail4Rosey: Who Says You Can't Reinvent the Light Bulb? When you turn on a light, you want light!! Right? Not the hazy, darkish light that creates big shadows and leaves it hard to read, take pictures, or generally just see what you are doing. I know a lot of people love the energy efficient swirly light bulbs, but something about a bulb with a million warnings makes me nervous. And they just don't produce the nice, bright light I want from my light source. Today I received two bulbs from Finally Light Bulb, and in a word, they are awesome. What is Finally Light Bulb? I'm glad you asked. Finally Light Bulb is a company that was faced with the task of trying to shoehorn LED and CFL technology into the familiar Incandescent shape we have known and loved. Their efforts were successful and the end result was an Acandescence light reminiscent of the light produced with the incandescent bulb from my youth. What does that mean? It means a nice bright light, not an "off" or matted shade, that is also energy-efficient (and that's totally a win-win). The revolutionary technology used to design these bulbs was created for one purpose: to create that wonderful light you got from an incandescent bulb, but to do so without the waste of energy those produced. Thanks to Finally Bulb, there is no longer the need to sacrifice light quality for efficiency. 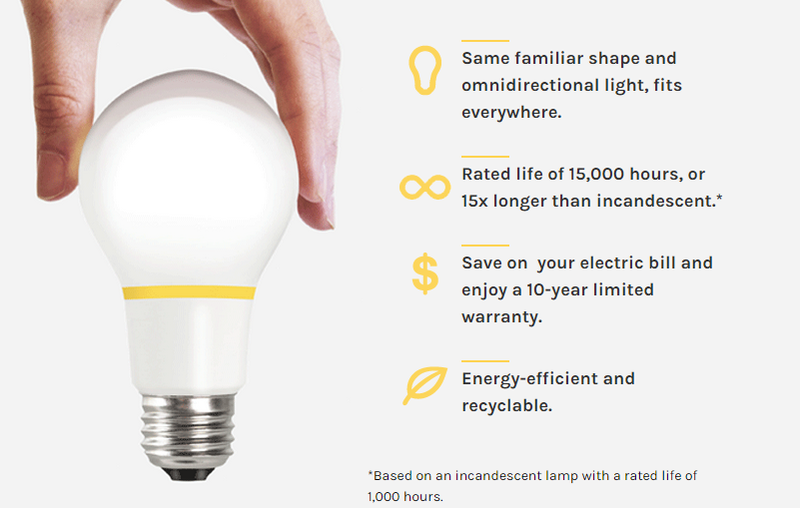 The bulb uses 75% less energy and lasts up to 15 times longer than a standard incandescent, all for under $10. -We didn't reinvent the light bulb. We just made it a whole lot better. You can learn more about the company by visiting the website. You can also follow along on Facebook and/or Twitter. I too have missed the old bulb. Having the new technology with the old design rocks. Ooo that's very cool and glad someone managed to finally invent something like this! 15 times longer would be awesome. I feel like bulbs are always blowing around my house. I know right! I'd like not having to worry about them for a while. I agree, this sounds more energy efficient and cost savings too! Awesome! I love to hear about companies that improve products and make them better to use and for our world. Thanks for sharing about Finally Light Bulb! Never heard of this company before and to be honest I use those swirly energy efficient bulbs throughout the house. Will have to check this one out some more. What a great idea. I hope they get the success they deserve. Finally, bulbs that are energy efficient and last longer. I will check this out. Oh, I so need to get this for my dad! He hates how CFL bulbs look and was hoarding the "Old" kind of lightbulbs, hahaha! We just started replacing a bunch of ours with LED. Will definitely have to price-compare these! Thanks for the info! I need to keep my eyes out for these bulbs. I love the value of this light bulb! I need to pick some of these up. I love their slogan. I love that they went back to the old design. Those twirly bulbs really irritate me for some reason! So it wasn't just Canada that punted the old light bulbs? I am not a big fan of the swirly ones either. They are Super dangerous if they break and with this many kids I don't want to deal with anymore issues than I need to. I wonder if we can purchase these bulbs in Canada? My husband will be happy about this. The isn't a fan of the new light bulbs. Catherine S.
Wow, they do sound great. I'd love trying some of these out in the hallways! This is so efficient! I love making the switch to products like this - better for the environment and my pocketbook! This is not a brand I am familiar with. It sounds like an energy efficient bulb I need in my house. To this day I am still so amazed with a light bulb. I would love to switch to LED lights. I will have to pick some up and start switching my bulbs over. When i turn on a light i want it to be bright. I will have to pick up some LED lights and give them a try. Wow this sounds great! I would like to have this in the area we homeschool it would be helpful! I like the idea of having a light bulb like this one. I am not very happy with the lighting in our home and this probably would help. Yes! I have missed the kind of light from incandescent bulbs! While we replaced our bulbs with a more efficient LED version, I don't like the type of light it gives off...this is so welcome! We recently installed some recessed lights and the electrician suggest fitting them with energy efficient bulbs. I am curious to see if I can use these bulbs. We use CFLs in our house. I will check out this brand of light bulb. I have not tried an LED light bulb yet, but if this would last 15 times longer than an incandescent bulb, then I am all for it. This is awesome. Re-inventing the old bulb with latest technology is really a great idea to go for. 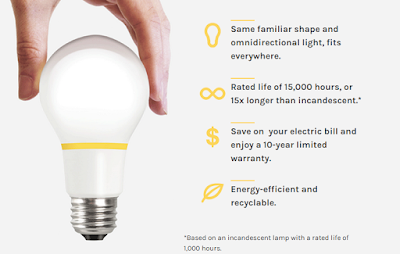 Sounds like an amazing energy efficient bulb which is worth for every home. I am soooo glad that lightbulbs have changed since when I was little! I want my purchases to last longer than just a few months! I will have to check these out! This is great! Lightbulbs don't seem like something to fret about but the different types put off different light. I really don't like the newer ones as much and so just re-inventing the older a little sounds awesome. style is awesome as well! Planeja alcançar 1000 unidades até 2022.
lebih segera daripada biasanya Dapatykah anda menyarankan penyedia website hosting yg baik dgn harga yang jujur? Terima kasih tidak sedikit aku menghargai itu!